Plenty of doom and gloom has been surrounding athletics in the state of Georgia lately. Of course by now everyone has heard of the Todd Gurley suspension. Georgia Tech fell from the ranks of the unbeaten by dropping a tough one at home to Duke. The Falcons continued their whirlwind of bad play by losing to the Chicago Bears at the Dome. The Silverbacks are in last place and have fired their coach, but I am not here to highlight the recent misery of the Atlanta sports fan. I am here to spin you on a positive: the Atlanta Hawks. Atlanta’s other dirty birds have quietly made the playoffs in seven consecutive seasons; the second-longest streak in the NBA only behind the San Antonio Spurs. I’ll bet you didn’t realize that! Atlanta hasn’t hoisted the Larry O’Brien trophy yet, but credit still must be given to the franchise for becoming a staple in the postseason. The Hawks have managed to make the playoffs under three different coaches during the streak. The franchise re- cord is 11 straight appearances, which started back when the team was still in St. Louis. 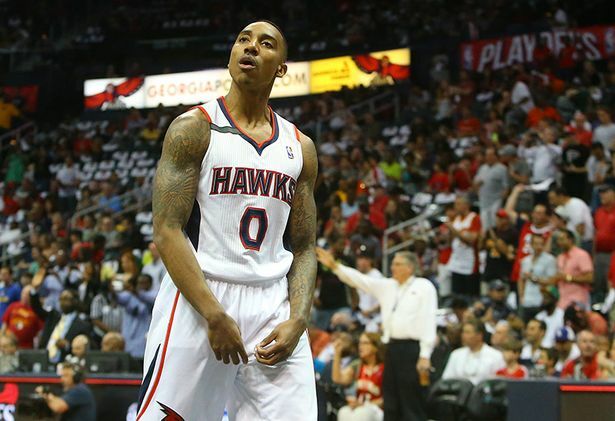 The Hawks have benefited from playing in the weak Eastern Conference. Coach Mike Budenholzer went just 38-44 in his first season, but managed to capture the eighth seed and push the top-seeded Indiana Pacers to the brink of elimination. Coach Bud did a great job keeping the team together after the injury to star center Al Horford. Atlanta actually was 25-21 at one point, but the loss of the team’s leading scorer eventually hamstringed the Hawks and sent them limping into the postseason. A healthy Horford along with another season of Paul Millsap, the emergence of Mike Scott and some nice depth signings will likely propel Atlanta into the mix for a 4-6 seed this year. The duo of Millsap and Horford was short lived last season, but the two bigs complement each other well. Horford is more of a true post presence with the ability to score with his back to the basket. Millsap at 6-foot-8 is an undersized power forward who uses his versatility to step away from the basket and become a matchup nightmare for opponents. He took a career high 212 threes last season and was able to connect at a respectable 35.8 percent clip. Millsap’s growth was not only evident with the long ball; he also posted a career high 3.1 assists per game and grabbed 8.5 rebounds per contest. Mike Scott was another player who greatly benefited from Horford’s absence. The former Virginia Wahoo turned himself into a three-point shooter and knocked down 62 on the season. Scott’s 36 minutes played on the line projected him out at 18.6 points per game and seven rebounds. He will be vying for a bigger role this season and will have to beat out rookie Adreian Payne, who was selected at No. 15 this summer. The Michigan State Spartan brings a lot of the same intangibles as Scott, but has proven to be a little trigger-happy with the three-ball throughout his college career. Thabo Sefolosha and Kent Bazemore were signed this offseason to add length and depth to the wing position. Their athleticism will fit into the “3 & D” mold nicely, as they will be expected to lock down opposing guards and hit corner threes. DeMarre Carroll excelled at this role last year and will be relied upon again to produce. Starting point guard Jeff Teague’s slow but steady improvement continued as he re- corded a career high 16.5 points per game. He also dished out 6.7 assists per game, but must cut down on the turnovers to become an elite point guard. Along with Teague in the backcourt, Kyle Korver remains the league’s top marksmen from downtown. With a healthy team, the Hawks have a chance to make noise this year. Another season in the Budenholzer system should reap benefits for the talented team. Mike Muscala has played well this preseason and should add some depth up front. Aside from the Cavaliers, the East should be wide open this season. Atlanta has managed to maintain payroll flexibility so if a trade presents itself at the deadline they will have the funds to make it happen. It should be another exciting season at the Highlight Factory.